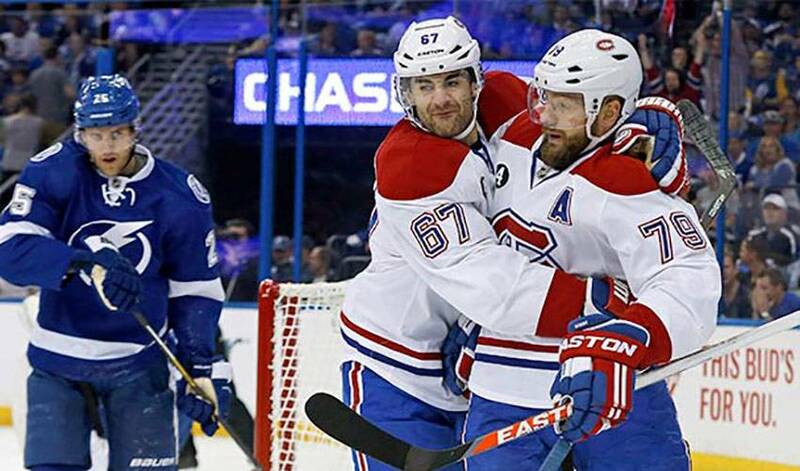 With Montreal’s season on the line, staring directly into a 3-0 series deficit, Max Pacioretty stepped up with a big effort to help ground the Lightning in Tampa Bay. After a heartbreaking last-second loss in Game 3, the Canadiens responded with an authoritative 6-2 win Thursday evening, sending the series back to 'La Belle Province. For his part, Pacioretty had a three-point game, including a key shorthanded tally midway through the first period, helping the Habs seize control of the game early on. STAT PACK: Pacioretty saw 17:30 of ice time, taking three shots in 29 shifts. NEED TO KNOW: On February 6, 2014, Pacioretty became the first Montreal player to have two penalty shots in the same game, coming against Vancouver, and just the second NHL player to be awarded two penalty shots in the same period. He missed both attempts, but still managed to record a hat trick. A FIRST RESULTS IN A FIRST: Pacioretty made his big-league debut with the Canadiens on January 2, 2009. He recorded first NHL goal on his first NHL shot in a 4–1 loss against New Jersey. MY PLACE: Pacioretty’s hometown, New Canaan, Connecticut, is one of the wealthiest communities in the United States. In 2013, it was ranked as the fifth wealthiest town in the nation. There have been several notable residents over the years, including talk show host David Letterman, actor Christopher Meloni, and singer/songwriter Paul Simon. FITTING THE BILL: After coming back from a near career-ending injury sustained in 2010-11 to have a breakout season, leading the Habs with 65 points over 79 games in 2011-12, Pacioretty was honoured in 2012 with the prestigious Bill Masterton trophy, awarded to the player that best exemplifies qualities of perseverance, team spirit and dedication to the sport of hockey. SWEATER ADDITION: On September 15, 2014, Pacioretty was named an alternate captain of the Canadiens. WATER WORKS: Pacioretty once listed taking an ice bath on game day as one of his superstitions. HONOURABLE MENTIONS: Patrick Kane (1G, 1A) helped Chicago sweep the Minnesota Wild courtesy of a 4-3 win on Thursday night. Corey Crawford made 34 saves in the ‘Hawks victory. Bryan Bickell and Jonathan Toews each had a pair of assists. Tomas Plekanec was brilliant in the face-off circle for the Habs, winning 19 of 27 draws.